Understanding your credit score is an important part of the home loan process. The credit scoreis a number that is derived from an individual's credit report and general credit history.Lenders use the credit score to determine potential higher risk borrowers. Historically, borrowers' with higher credit scores are less risky than borrowers' with low credit scores, since a higher credit score implies timely repayment of debt. Lenders will charge a higher interest rate to individuals who are higher risk. In other words the higher your credit score, the lower the interest rate will be, and the lower your monthlypayment will be. Banks and other lenders may use their own proprietary credit scoring, however most lending institutions use either the Fair Isaac's FICO scoring or the VantageScore scoring method of determining credit score. In both scoring systems varying importance is given to eachpart of an individual's credit report. The FICO score was developed by the Fair Isaac's Corporation. Currently as of 2008, the FICO scorerequires that at least one account be open for a minimum of 6 months and updated in thelast 6 months. This could make getting credit initially difficult, however responsible credit usecan quickly build a good credit score. The FICO score ranges in value from 300 to 850, with 300 being the highest risk for lenders and 850 being the lowest risk for lenders. The closer your score to 850 the better, since the lender will most likely give you lower interest rates. 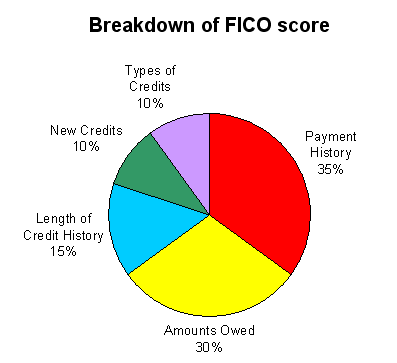 The FICO score is computed based on 5 basic components. Payment History is the most important part in determining FICO score. The payment historyis determined by your timeliness in paying off outstanding debt. It includes factors such as number and size of missed payments, how much is passed due, how frequently payments are missed,etc. The more consistently payments are made, the higher the score will be. The Amounts Owed is the second most important part in determining FICO score. The category includeshow much is owed, and the type of debt (mortgage, car loan, etc). It also depends on the numberof open accounts you have, and how much money is owed in comparison to the maximum limit (if applicable).In the case of credit cards, the lower the outstanding amount, the better, and the higher your score willbe. The Length of Credit History is just the length of time you have been using credit. If an account has been open for more than 2 years it could be beneficial to your credit score. Types of Credit in Use checks for varying types of credit you currently have, or have dealt with before. Some examples include credit card, mortgage, car loan, student loan, etc. This factor will likely be under closer scrutiny depending on what type of loan you are applying for. For example if you are applying for a credit card, then a lender will want to know how well you have handled credit cards in the past. Generally a mix of different credit types is ideal. However the variety of credit only accounts for a relatively small part of the credit score (10%), so it is unlikely that opening more accounts will help your credit score by much. A much better idea would be to make payments on the loans you already have on time, since that is a much bigger contributing factor. New credits are credit you have applied for in the last 6 months. The more credit lines opened implies that future debt may be harder to pay off, so it will decrease your credit score. What classifies as a good FICO score varies from time to time. However, Fair Isaac's tends to group scores into 8 main categories. You can get a good idea where you stand compared to the rest of the population. Similar to the FICO score payment history makes up the most significant part of VantageScore's rating.If you have been diligent and timely in repayment of debt then this will help your score. If you have missed payments, late payments, passed due payments, etc then your credit score will be lower. Utilization is the second most important part of VantageScore. It depends on how much credit you have used in relation to the maximum available in each account. If you are near the maximum credit limit, it will lower your credit score. This tells the recent balances in your accounts as reported by your lenders. It also tells any recently delinquent balances. If you have delinquent or a large increase in your current balances it will lower your credit score. Depth of credit includes how long you have had a credit history, as well as the different typesof credit used. Recent credit are credit accounts that have been opened recently. At first opening a new account will likely lower your credit score, however after making consistent and timely payments it will increase your credit score. Available credit is the total amount of credit you have available in all of your open accounts. The less credit you have used the better, since it will have a positive influence on yourscore. 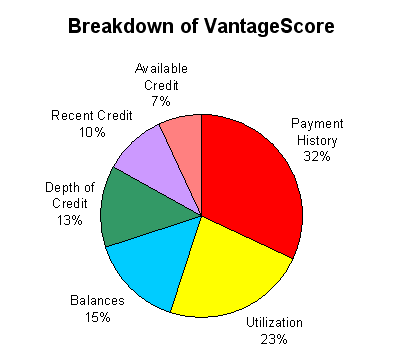 Once again just as with the FICO score, the question that comes up is what is a VantageScore? The answer will once again vary from time to time. But in any case it is best to keep your credit score as high as possible. Most lenders will used what is called risk based pricing in making loan decisions. Basically the riskier the borrower the higher the interest rate to compensate for the higher risk.Getting a home loan does not require a perfect credit score, however the lower your credit score,the higher the interest rate, and the monthly payment. 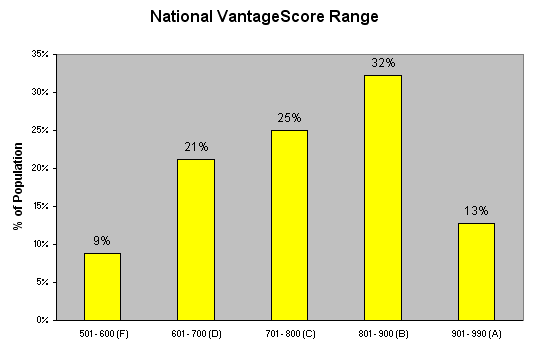 Let's look at an example of getting a $300,000 30 year fixed rate mortgage at the national average with different credit scores in late 2008. This example is from the Fair Isaac Corporation. Notice how as the credit score decreases the interest rates, and subsequent monthly payment increases. It is very important to keep up with loan payments, and to seek an immediate solution to any delinquent payments. Credit scoring whether FICO or VantageScore will be a deciding factor in getting a loan with a favorable interest rate. If your credit score is low then it might be wise to wait a few years, and improve your credit score before applying for a mortgage. Then since your credit score is higher, you will likely get lower interest rates.